Got the best night’s sleep as just getting over the time change, now that this short vacation is almost over. Oh well. In order to get to everything we wanted to do, we decided today we would be using the metro to get around town rather than our normal preference of walking everywhere. There was too much to get to. Today dawned with blue sky. We weren’t sure what to make of it. 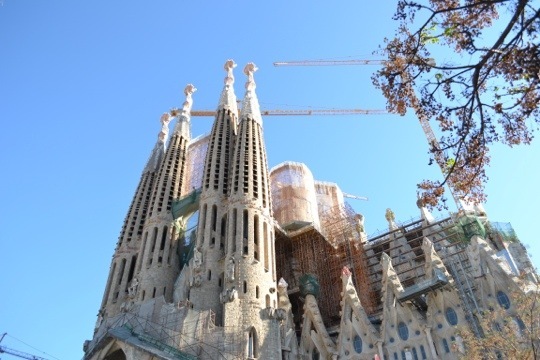 Ellen suggested we return to Sagrada Familia to take pictures again, this time with an unthreatening sky. So we did. It was worth it. Next we traveled to the Gothic Quarter. There were two churches to see, but we most importantly had to get to the Museum Picasso. It features 3800 of his works. I think I liked his pottery and ceramics on display the best. We then went to the market on Las Ramblas to get fresh fruit for me. We didn’t manage a Seder, but I am keeping Passover. We found a restaurant nearby for Ellen to get lunch, and enjoyed resting our feet for a little awhile. 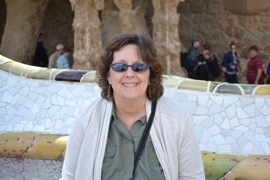 Our final destination was perhaps our most anticipated: Parc Guell. The large picture above shows the fantastic two buildings that are the focal point. I thought they looked like something out of Candyland. To get to the park, we took the metro. Upon exit there was a sign that the park was only 600 meters away. That 600 meters, however, was almost straight up a hill. Most of it you had to walk but there were also several escalators. We entered the park from above, and got wonderful views of the whole city. 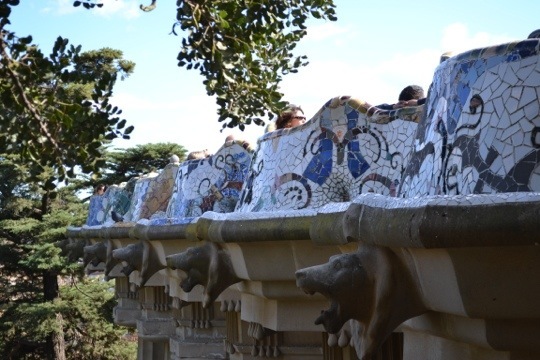 We walked then to the overlook of the Gaudi buildings. It is ringed by a serpentine mosaic tile bench that is remarkable in and of itself. Ellen enjoyed the sun so much she let me take her picture. That’s a rare event. You’ll also notice there are almost never pictures of the two of us. Even after 26 years of marriage, she doesn’t like there being proof that we are traveling together. Last destination of the day was Barceloneta. It allowed our first up-close view of the Mediterranean. Ellen had a drink by the water, we stopped for coffee and tea and then went to dinner at Can Majo. We treated ourselves to our most expensive meal of the trip, which still wasn’t that expensive. Ellen had cod and I had grilled sole. We metro’d back to our apartment to pack. We have an alarm set for the ungodly hour of 4:50am tomorrow to fly to Paris and then Back to DC. With my daughter reading this trip report, I will be careful to minimize typos. My apologies for those who read yesterday’s entry before it was corrected. 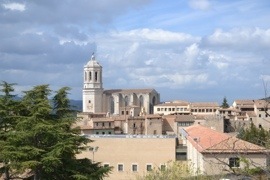 Today was a day trip to the medieval city of Girona. It should have been an easy 1.5 hour train trip. But we had a few adventures along the way. We walked about 20 minutes from our apartment to the main train station. We bought our tickets, and then had a small breakfast. The train trip started normally, but then at a stop just outside of Barcelona, everyone started getting off. At first we just thought it was just a popular stop. A fellow passenger told us in English that we had to get off. We soon recognized the signs of track work: there were buses waiting. We didn’t know how far we were going, but we were getting a bus ride! It was well organized and the ride was only about 15 minutes to another station to continue or trip. The next problem was with one passenger sleeping (me) and poor station announcements, we somehow missed our station. 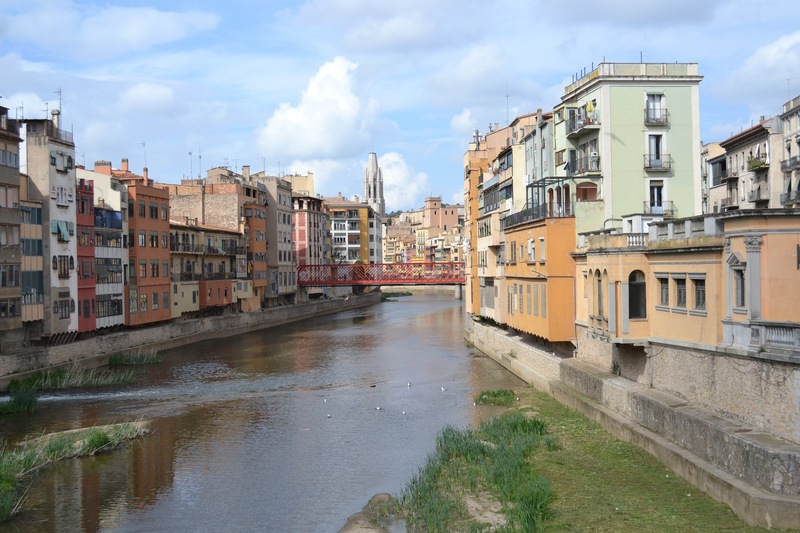 We jumped off when we realized that, and luckily got on a train about 5 minutes later back to Girona. As you can tell from the picture above, it is a beautiful city. We were attracted by the cathedral and the old Jewish quarter. It being both Passover and Good Friday, it seemed like a good combination. We went immediately to the Jewish museum, as it closed at 2. 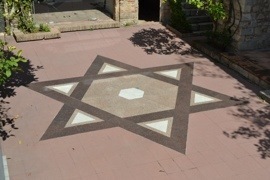 The Museum of Jewish History provided a fascinating view of Jewish life in Spain from 900 to 1492. A thriving population provided services to the Christians and lived for the most part in peace to practice their religion. Tombstones in Hebrew and other artifacts helped paint a picture of life there. But the inquisition changed everything, and forced conversions and violence eventually led to the expulsion of the remaining Jews in 1492. I was moved by the museum visit. 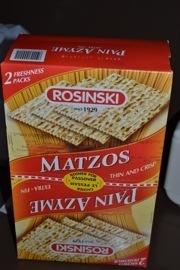 I made one purchase from the museum: a 2 pound box of Matzah. Way more than I’ll need for a few days, it was just too convenient to pass up. We ate lunch at an outdoor cafe. There was even a little sun out. We then visited the cathedral. While an impressive structure, the visit to the museum left me not attuned to the wonders of civilized Europe. The same people who built the church, killed Jews who had been their neighbors. 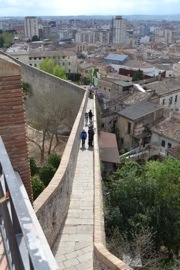 We then took a walk around the old city wall, which offered great views. We then took the train home. This time, we were unsurprised by the bus diversion, and even explained to some American students what was happening. We stopped only to dump our stuff at the apartment before setting out for dinner. We had selected a few places from the guidebooks, but found the first closed for Good Friday and the 2nd too far a walk to gamble on. So we walked the streets until we found a place that looked good. We wandered into Via Dei Mille around 9pm. The menu looked good, but there wasn’t a soul in the place. We ordered salads and pizzas. The place soon filled up. The wood burning oven produced tasty pizza that Ellen could see being prepared as ordered. It was a good meal that Ellen later found recommended in TripAdvisor. Back to the apartment again around 10:30, we struggled to figure out the washing machine and then retired for our last day in Barcelona. 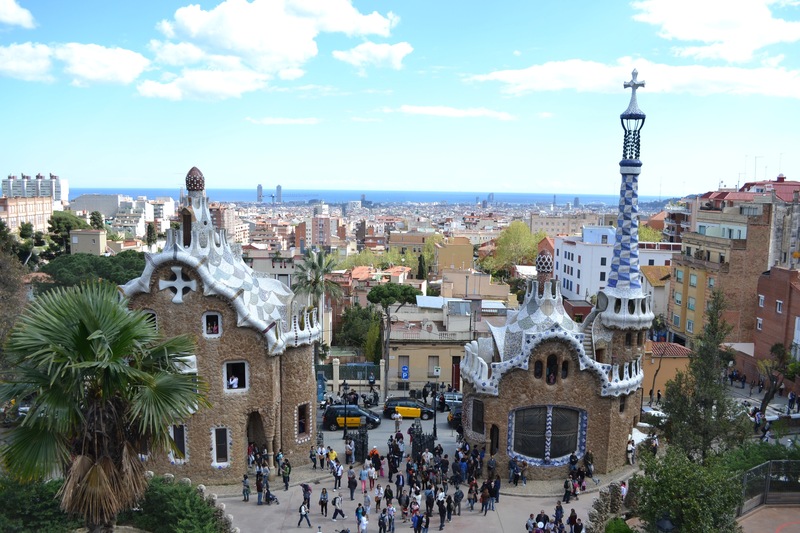 We enjoyed our mini-vacation to Spain last year so much that we decided to take another 5 day trip. 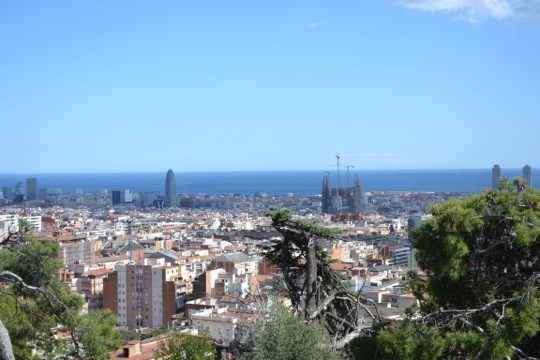 And there was more of Spain to see, so we picked Barcelona. This vacation started off with a logistics glitch, very rare for us. Our KLM plane from Dulles to Amsterdam was delayed, which would have caused us to miss our connecting flight. The KLM counter was chaotic when we got there, and we mostly watched in amusement as we had arrived plenty early and we couldn’t change the flight issue. Ellen flat out refused to move from the counter to another line to be rebooked. Luckily, the supervisor agreed. A young man took over as our agent, and he initially had us on a 2pm, instead of 10:30am, flight from Amsterdam to Paris. But he went away and then asked if we’d like to get to Barcelona sooner. Kinda a dumb question, right? So he went away again, this time for maybe 1/2 an hour. Upon his return, he had moved us to a later flight from Dulles to Paris, but then an earlier flight from Paris to Barcelona. So the net of it was, we’d get to Barcelona about 2 hours later than the original reservations instead of more than 3. We had a drink at Harry’s next door to KLM’s counter, as they asked us to wait to check our luggage. Once that was done, we went to our gate. We were also armed with 2 $10 coupons for food. So KLM and Air France did a reasonable job of fixing the problem. We had a lot of time at Dulles, but made the best of it. We like the 10pm flight from Dulles to Paris (taking it again in July), because you can get right on and sleep. We had paid extra for bulkhead seats with more legroom, but they unfortunately also were narrower. We made it through the flight, but Ellen wasn’t happy. She vowed that it will be economy comfort or better from now on. We had about 1.5 hours in Paris, just enough to take a bus between terminals and get a bottle of water. The short flight from Paris to Barcelona was uneventful. We took an airport bus into Barcelona. It cost just €5.30 each and was perfect. It left us just a 10 minute walk to our hotel. We are staying at the UP Suites, an apartment-type hotel on Valencia Street. Featuring a kitchen, dishwasher and washing machine, it feels like our place instead of a hotel. Ellen booked this to make it easier when Passover starts on Friday. We barely set our things down before heading to a grocery store. We love the experience, and at the travel convention in DC, we just recently heard Samantha Brown recommend grocery stores as a cylindrical flash card lesson in your new country. We bought things for breakfast and a little more. For dinner, I picked a tapas restaurant out of Frommers. First challenge was finding a place that was open before 8:30pm. We know that’s how Spaniards live, but it’s hard when traveling for a few days and adjusting to the time change to move our dinner time so much. 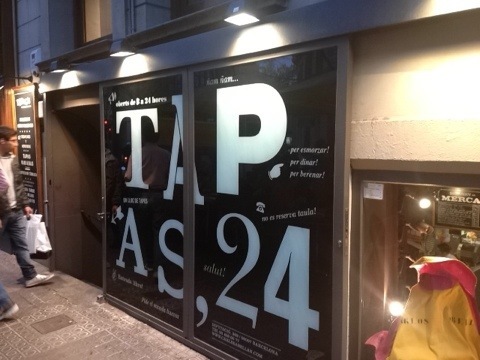 We went to Tapas,24. It was a bit of a walk, and there was a little wait, but we got a table outside. We couldn’t understand anything on the menu, but when given an English menu, all was fine. We had a number of dishes, potatoes with aoli, fried anchovies, lamb kabob, beef stew among them. It was delicious, reasonably priced, and left us full but not stuffed. 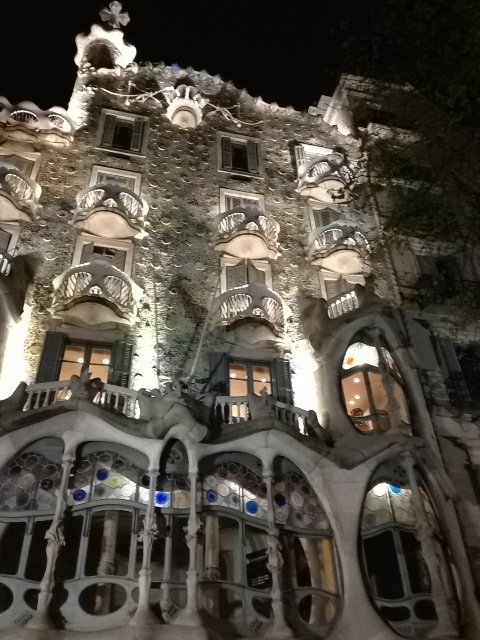 We took a leisurely walk back to the hotel, stumbling upon the building pictured above. Tomorrow we will begin our sightseeing in earnest, but we made it here, have our bearings and are ready for the experience.